Our Black Cumin Seed Oil yields a high dose of thymoquinone, one of the actives in black cumin seed oil, indicated for allergies, rheumatisms, and inflammation. 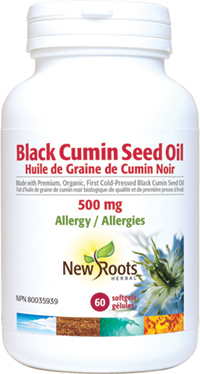 New Roots Herbal’s pure Black Cumin Seed Oil can provide the natural measure of relief that today’s allergy sufferers require. Black cumin seed oil originates back over 3,400 years! Russians call it “chernushka”; it is “faux Anis” in France, “happa sooda” in Oman, “gentle love of the mist” in North America, and “Roman coriander” in Rome. Nigella sativa and its black seed are known by other names, varying between places. Some call it “black caraway,” “habbat al-barakah,” and “habbat sawda”; others call it “black cumin” (kalounji), or even “coriander seeds.” In English, the Nigella sativa plant is commonly referred to as “black cumin”. Nevertheless, this is Nigella sativa, which has been known and used from ancient times and is also known in Persian as “shonaiz”. Black cumin seed oil has been and is still used for numerous health and beauty reasons, in dozens of countries throughout the world. Now, black cumin seed oil’s special properties are becoming a blessing to asthma sufferers. An annual herbaceous plant, black cumin (Nigella sativa) is believed to be indigenous to the Mediterranean region, but has been cultivated in other parts of the world including the Arabian peninsula, northern Africa, and parts of Asia. Tiny and hairy, being no more than 3 mm in length, black cumin originates from the common fennel flower plant of the buttercup (Ranunculaceae) family. Nigella sativa is sometimes mistakenly confused with the fennel herb plant (Foeniculum vulgare). Within institutes worldwide, black cumin seed oil is being studied as new therapies for chronic illness and their effects. Findings are identical to those in previous studies by earlier researchers. Studies show that by using black cumin seed oil, valuable unsaturated fatty acids, for example linoleic and gamma-linolenic acids, get into the organism. This allows a synthesis of important immune-regulating substances derived from prostaglandin E1. Linoleic acid stabilizes the cell membranes, and prostaglandin has the effect of inhibiting inflammation. Thus the immune reactions are stopped, causing illnesses and furthermore could be the start of many chronic illnesses like acne and hayfever, right up to cancer. In addition, the excessive T9‑cell activity of the person suffering from allergies is stabilized through the substance found in black cumin seed oil, as are the abnormally rising immune reactions through suppressed antibodies. Lately, scientists around the world have also confirmed the antibacterial and antimycotic effects of black cumin seed oil. Health-care practitioners in various countries are using the oil against inflammation of all sorts as well as fungi infections. Scientists have even found a remarkable reduction of blood sugar levels. Black cumin seed has been found to help stimulate bone marrow and immune cells, stated by scientists of the Cancer Immuno-Biology Laboratory, adding that it raises interferon production, protects normal cells against cell-destroying free radicals, destroys tumour cells, and raises antibodies-producing B cells. Studies also testify that weak immune systems be regulated by the strong effect of the black cumin seed oil. Scientists have tested the effects of the oil on 600 patients, with results that confirm the cure for allergies at about 70% of the patients. Among them were allergies against pollen and dust, acne, neurodermatological illnesses, asthma patients, etc., who generally have a weak resistance and are prone to suffer from infections. Adults: Take 2 softgels three times daily with food or as directed by your health-care practitioner. If you are taking supplements containing iron, zinc, calcium, or copper, take this product a few hours before or after them. Consult a health-care practitioner for use beyond 4 weeks. Other ingredients: Mixed tocopherol concentrate (from sunflower) in a softgel made of bovine gelatin, glycerin, and purified water. ʟ‑Methionine is one of the essential sulphur amino acids. Our hybrid antioxidant and digestive-enzyme formula scavenges free radicals and reduces oxidative stress which can damage cell walls. Our bioflavonoids are combined with hesperidin and quercertin. Quercetin is a plant-sourced antioxidant compound for the maintenance of good health suitable for the dynamic and demanding world we share.